Next weekend I'm going to be looking for a new razor to treat myself to. I have always loved the look of the Aristocrat #22 so I have set my heart on that. My question is, are they easy razors to come by? And what is a good price range for one? I'm looking for one in as best of condition I can get my hands on. I'm very new to buying vintage razors, so have no idea what is a good price for one. Also if I cannot locate a #22 is there a similar one to that? 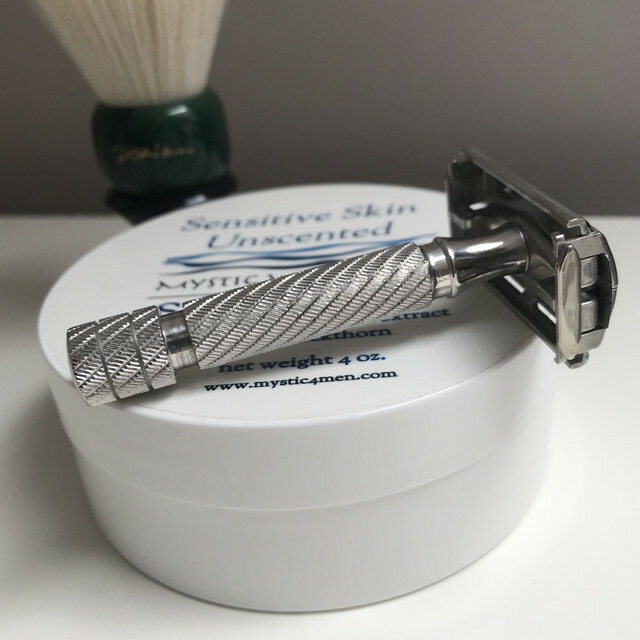 These razors are almost built like tanks, the main fault is worn plating (not easily corrected as their is nobody currently offering a replating service in the UK). Next weekend I'm going to be looking for a new razor to treat myself to. Unless you have money to spare for overpriced 'Buy It Now' items on eBay or strike lucky, this is not a good option. Need to be checking eBay daily and bidding tactically. Thanks for the advice. Do you think it would be wise to put a want to buy, in the buy, sell section? the #22 set comes either with 3rd and 4th generation aristocrats. The 3rd gen is the better shaver in my book. I am now the proud owner of an Aristocrat #66 had my first shave with it last night and was the smoothest shave I've had in a very long time. So glad I finally got myself one of these razors. Thanks to Steve for selling me such a great razor and being an absolute pleasure to deal with. The #66 set comes only with 4th gen aristocrat. Now you need to find a 3rd gen razor. I’ve owned multiples of each ‘generation’ of British Aristocrats. Each shaved differently - even the three #16s had different characters. My favourite was a #22 (‘fourth gen’) and the only one I kept. The best shaver, for me, even if not quite as pretty as the solid plate. Also, does anyone know what these V-shaped notches are under the base plate? I've never seen them before on a razor. Production error. send them all to me for safe disposal. My late 40s super speed has them. My 64 slim does not have them. Don't have a clue what they are for. Would be interesting to know what they are for if in fact they were put there for a purpose. Just had my second shave with this razor, and wow. Imgetting the smoothest shaves I've ever had. I wish I would have gotten one year's ago. is there a webpage "Rosetta Stone" that decrypts the totally confusing British Gillette numbering system? 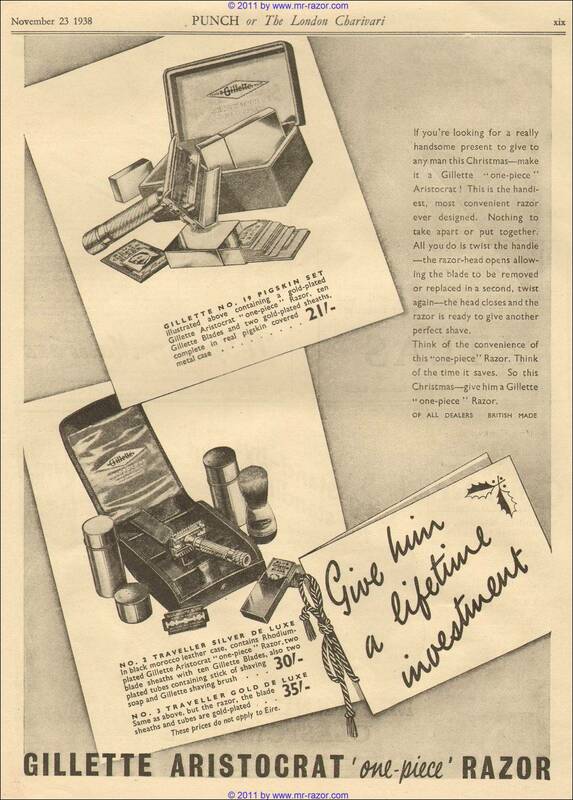 Gillette England did it on purpose to confuse us - the collectors and explorers. Additionally, this same razor comes in #14, #15 and #20 sets (not on the ad). I have a very nice and complete #22 set with original instructions that I have never actually shaved with. This thread has made me think about giving it a try. Didn't know that it was a 4th generation. Is it supposed to be a very mild razor?